Dorm rooms aren’t known for their spaciousness. And even if you have the good fortune of having your own apartment while you’re in college, you aren’t likely to have a big one. Choosing smart furniture will help you get more functionality out of your space and even make your dorm or apartment feel larger. You just have to know what pieces make the most impact! A wall bed, also sometimes called a hidden bed or a Murphy wall bed, is a bed mounted on a platform that lifts up and rests vertically against the wall. With a wall bed, you can clear up a lot of space during the day by essentially putting your bed away every day. You can’t see the mattress against the wall – it tucks out of sight into a cabinet that can include shelves or even a desk. 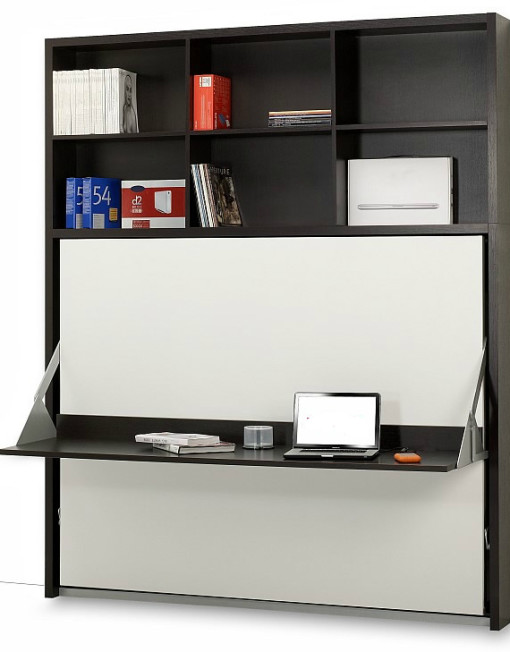 Some wall beds come in a combination unit that includes a sofa, a desk, book shelves, and more. You can get one piece of furniture that takes care of all your needs in your dorm. You can have a wonderful study space during the day and a comfortable sleeping space at night. Your dorm may not have the vertical space to accommodate a wall bed, or it may not have the wall support for the structure. 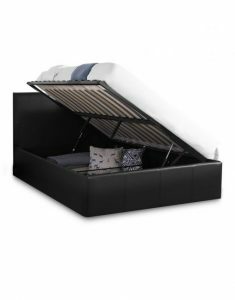 You can still save space in your dorm with a storage bed. The platform lifts the mattress up so you can access the area below, which is surrounded on all sides. You have a hidden storage area to keep your dirty laundry, extra text books, and any other items that would normally just be cluttering up your floor. Just keeping your floors clear will make your dorm room look a lot bigger, and it will keep you from a lot of arguments with your dorm mate. Many college students get a small, studio apartment instead of a dorm. One way that they can make more room in a studio is to get a diy loft bed kit. These aren’t the quasi-bunk beds you had as children that just raise the mattress to about chest level. These are whole platforms that create a bedroom above your head. The platform is big enough for a mattress and a few other items, such as a small chest for clothes or a small shelf for books. Under the platform, you can create a seating area for guests or a study area. Using a loft system is like creating another room where there was none. You just have to have ceilings high enough to accommodate it. You may even be able to use a loft system in a dorm room if the room is large enough. Open wall shelving helps you keep your books and other items organized without taking up a lot of room. Modular shelving allows you to create whatever look you like for your shelving. You just snap the pieces into different configurations. 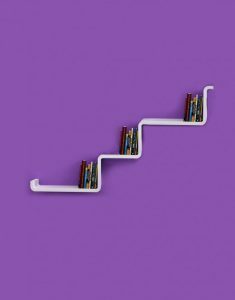 You can have a stair step that goes from your floor to your ceiling, or you can have small cube shelves that dot the wall in a pleasing pattern. You can even create fun shapes like dogs or whales. Modular wall shelving can be easily hung in any dorm or apartment, and it is a cinch to put together. 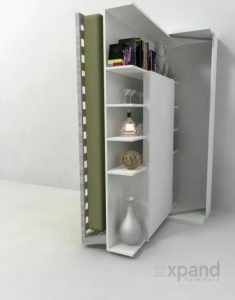 It’s a great solution for storage that takes up much less space that bulky bookcases. Good lighting can make small spaces seem a lot larger and more inviting. Add a few floor lamps and desk lamps to what is already in the room. Also consider adding spot lights to your shelves or your bookcases. The more you can light the room up, the more open it will seem. Mirrors also have the same effect, so add a few decorative mirrors to the room, as well. The mirror will also reflect the light, helping you to get more benefit from that. Of course, you should also decorate your room with things that show off your personality and make you feel good to be in the space, such as art work, decorative linens, and plants. This is your space! It should be functional, but it should also be fun. Expand Furniture has the furniture and décor options to help you create a beautiful dorm room or apartment that you will love spending time in, even when you are pulling an all-nighter for a big paper or exam. Explore our online catalog to find the pieces you’ll love!